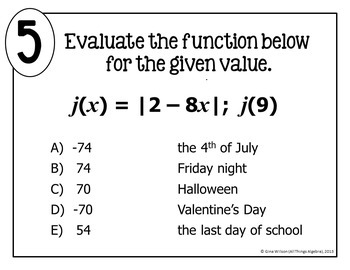 In this activity, students will practice evaluating functions written in function notation for specified values. 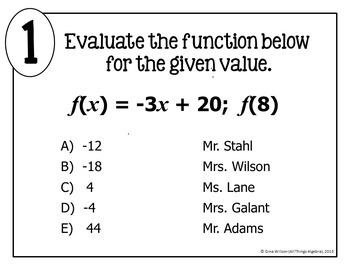 This includes more challenging problems like f(10) + 5, g(9) + g(-2) and 5 - 2[f(-1)]. Some problems also include fractions and absolute value. 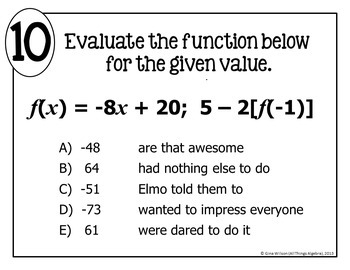 The answers they get will generate a funny story about their teacher. This is a much more fun approach to multiple choice, and the students adore reading the story to the class. They get very excited to see which of their teachers is the "star" of the story. New: ALL slides are given in an editable format so you are free to personalize the story for your students. PowerPoint is required to edit. Only story elements can be changed, not the actual problems. 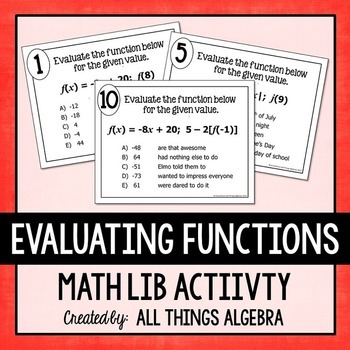 Mathlibs is the registered trademark of kidCourses.com and is used with permission by All Things Algebra, a friend and strategic partner of, and a collaborator and contributor for kidCourses.com.